80 lb Cubera Snappers, 400 lb Black Marlin, Bait City! In this ever changing world of Sportfishing you never really get a handle on it because all you can is react. That´s the exciting part, the reaction to a screaming reel(s) as the captain yells ¨Fish On¨! Will get your get your blood pressure up a little. If this gives you goose bumps, then now is the time to head out to the deep water locations. Marlin are not exactly abundant, but they are here at Corbeteña and El Banco and they´re in the 400 lb range. Not monsters by any stretch, but big enough amigos. Now that´s jaded, four hundred pounds of pure muscle and bad attitude and this is a small fish!? In this case, size is not the issue, dare I say it, it´s the motion that gets you on the ocean that matters! The weather here in Puerto Vallarta has been mild for this time of the year. Yes the humidity is up, but that´s part of the life here in PV! Rain, yep, we´re seeing rain about four out of seven nights a week. The locals love the rain, it cools the evening down and just makes the city sparkle with fresh tropical air breezes. Paradise is never perfect, but this could be worse. 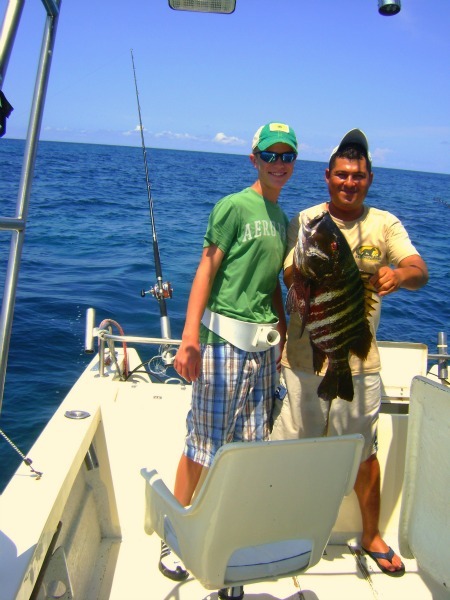 For the summer traveler, you´re in luck, fishing season is just starting and we´re seeing some great fishing at all the world class fishing grounds Puerto Vallarta is famous for! The Marietta Islands have been hot and cold, hence the pedal to the metal title. Some days last week, too much bait, couldn´t get a strike for nothing! But boy has that changed. 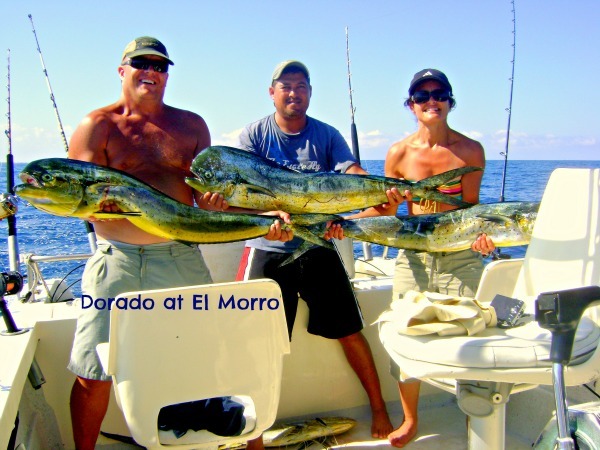 Dorado in the 35 lb range are all around the island. Red Snappers to 30 lbs and abundant, Bonito, Sierra Mackerals, Sailfish and even some Rooster fish (not many). Roosters could be coming in now, so stay tuned, this would be great for the fly fishing or light tackle guys! Anything is possible right now, so get out there. With Spinner Dolphin in the area the Football Yellowin Tuna (Footballs) are in the 40 to50 lb size range, so keep an eye pealed! Eight hour trips are well worth the time and the fuel dollar, so get out there, this is fishing season, and it´s a great season! 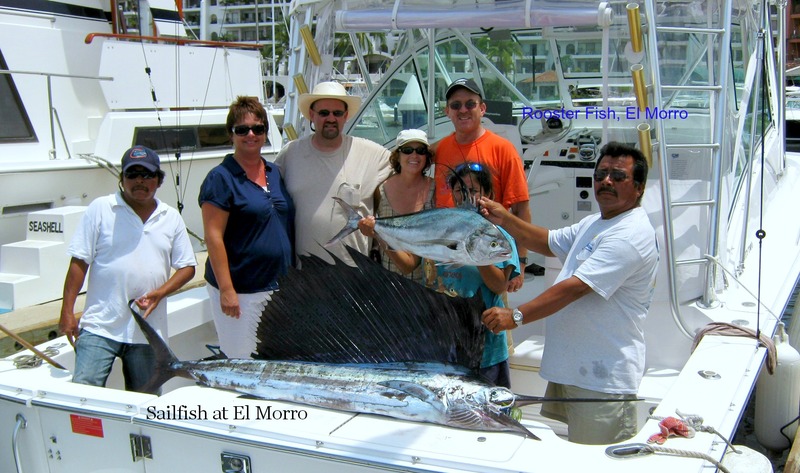 Lets not forget about El Morro, Sailfish and Dorado are increasing by the moment at this much forgotten location just six miles south of the Marietta Islands. If you were one of the contrarians, you were hitting 70 lb Sailfish, 30 lb Red Snappers and 40 lb Dorado! That´s about all, but that´s enough. The area I call the golden triangle is alive with much ignored action. Many pods of Spinner Dolphin are in this area between the Marietta Islands / El Morro, to Corbeteña, up to El Banco and then back to the Marietta islands, ripe, fertile fishing grounds. Ignored like the skinny chick in High School, who´s now a super model!! Inside the bay, the trash line has been a little weak, not much rain and the fish can pick through this organic stuff in a real hurry. But that´s not to say the fishing is less than fantastic. Yelapa has 35 to 50 lb Yellowfin Footballs just hanging out. You don´t need to head to Corbeteña to get these Footballs. Figure six hours in the bay, small Dorado about 25 lbs, Skip Jack Tuna (Skippies), Bonito, Snappers, Snook at the river mouth and who knows, the list goes on! Now if you´re still looking for a trash line that is ¨working¨, then Anclote reef area just north of the point at Punta Mita is working well. There are Rooster fish on this reef gorging themselves on the ¨trash¨. Sailfish are a little farther out and you may even hit some decent sized Dorado. With the full moon moving deeper and deeper into the month we´ll be looking at an earlier and earlier bites amigos. Remember with the full moon comes early and late day bites. You could be at the fishing grounds when the sun comes up and find you missed the bite. So if you´re serious, pay attention to the moon phase, and make sure you´re at the place you want to be at least two hours before the sun comes up and you can have the bite, the day and the fantasy all come to life!